EPIX(R), an MGM company, announced the second-season renewal of its award-winning documentary series “America Divided,” at the 2017 Television Critics Association Summer Press Tour. The 4-episode second season will premiere on EPIX in 2018. 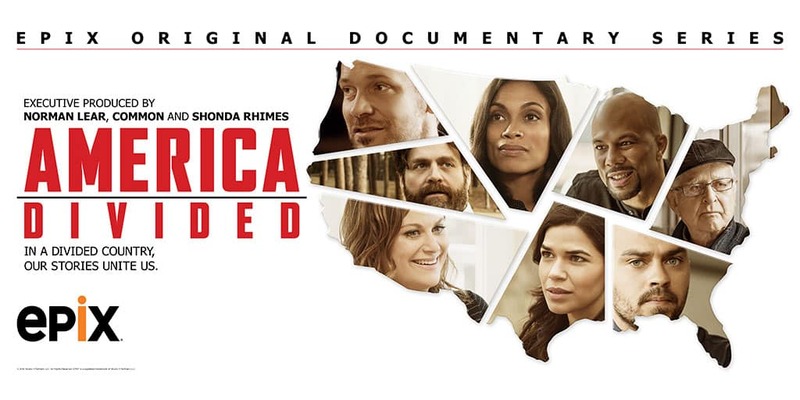 In 2016, the award-winning celebrity-driven docu-series “America Divided” presented riveting stories about the critical issues tearing at our society – from the criminal justice system and education, to housing and heroin, to threats facing American democracy itself. In Season Two, Norman Lear and Jesse Williams return as executive producers and correspondents with another cast of celebrated Americans to continue the series’ mission to explore America’s most urgent challenges. The second season will once again go cross-country to investigate the forces driving us apart and introduce viewers to ordinary people engaged in extraordinary efforts to overcome our country’s racial, class, gender, religious and partisan divides. Divided Films and RadicalMedia, the production companies responsible for Season One of the series, will return for season two. Series creators Solly Granatstein, Lucian Read and Richard Rowley will return for Divided Films, as will Jon Kamen and Justin Wilkes for Radical Media. Along with Lear, Brent Miller of Act III Productions will return as an executive producer.